NOTE: If the message card show any problem such as,speeds up, freezes, or does not respond to button commands. Try Reseting The Message Card by taking out the battery and wait for 10 seconds, then reinsert battery. Q. My Name Tage message freezes after a while. A. If message stops playing and lights go static Means Need to change battery. Q. How long can the battery last? Q. How long of a message can I store in the message card? Q. Cannot turn off unit after Set mode. A. You cannot turn off the unit while in set mode. Complete programming unit than exit Set mode by depressing the Set mode button for 3 seconds. The message will start to scroll and you can turn off. If the problem persists, reset unit by removing and reinserting battery. Q. The message does not scroll and lights appear frozen on screen. A. This is an indicator that your battery needs to be replaced. Note about 2032 batteries: Batteries must be stored under ideal conditions for optimal performance. Do not allow batteries to touch or come in contact with any metal substance. This will immediately drain these batteries. Remove batteries from unit if not in use for a long period of time. Store batteries room temperature in non-metal material such as plastic. Push the latch of the door of battery with your thumb in direction, and pull the battery chamber out with your index in direction. Place the battery into the battery chamber with its anode facing the key side, and do not place it with wrong direction, then push in the battery chamber. Note: It is in space when there is no display. Install the 3.0V battery (CR-2032), and the device will switch on the screen automatically. 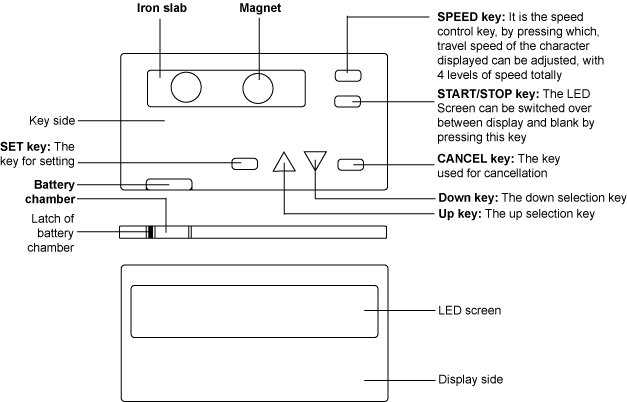 Setting characters to be displayed: Press and hold SET key over 3 seconds, the LED screen enters the setting status with "A" displayed. Now press UP or DOWN key to select the required character,and press SET key once to input the character. Repeat the foregoing steps until the content you desire to set is completed, then press and hold SET key to end the setting status, and the input characters will be saved and circularly displayed. Setting cancellation: By pressing CANCEL key once in course of setting, the last character can be removed. By pressing and holding CANCEL key for 3 seconds, it will exit the setting status, and the LED screen remains the content input last time.